As Christmas fast approaches, so does the gift-giving holiday season. This Christmas give the best gifts to your favorite pickleball players. These are all gifts that I’ve given to other pickleballers and they’ve always been very happy with them. Let’s get started! 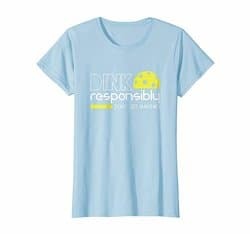 A best selling shirt on Amazon and worn by pickleball players across the nation, this Dink Responsibly Pickleball shirt is simply the best pickleball t-shirt you can wear. Look great on the court and dial in your dink with this funny pickleball shirt. This Dink Responsibly Pickleball Shirt makes the best Christmas gift for any pickleball player you know! Enjoy the look of pure happiness on their face when they unwrap and then put on this amazing shirt. Say Merry Christmas this year and spread good cheer by inviting other people to play pickleball with this Amazing Pickleball kit! Pickleball is a rapidly growing sport but that’s only because people keep recommending their friends and neighbors to play with them. 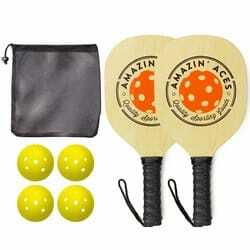 The Amazing Aces pickleball kit is the perfect starter gift for beginner pickleballers (link). With two paddles, four balls, and a carrying case it packs a terrific value. All of that for under $25 is simply a steal. Introduce a friend to pickleball this holiday season with this kit. Play pickleball more with some new balls! 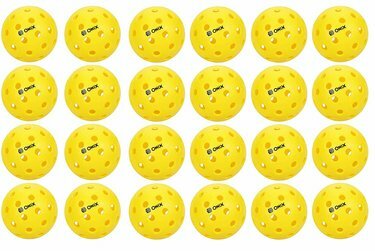 Onix outdoor pickleballs are specially designed to be extremely durable for outdoor play. These balls meet the USAPA requirements for outdoor pickleball tournaments which means you can get used to the same balls the pro’s use. They are slightly weighted heavier so that they fly straighter after a shot. These Onix pickleballs are a perfect stocking stuffer for the pickleball player in your life. Carry around your pickleball gear in style in this backpack designed exclusively for pickleball players. No longer do you have to have your hands full with pickleballs, your paddle, and water bottles as you walk to the court. This backpack has a big interior while still fitting comfortably on your back. It provides enough space for multiple paddles, balls, and water bottles. 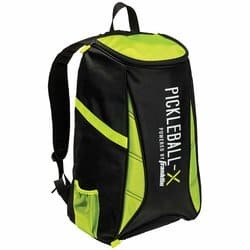 If you’re tired of lugging your equipment around by hand, grab this cheap pickleball backpack this Christmas. For those really interested in pickleball, grab a brand new pickleball glove as a Christmas gift to yourself or others. Gloves are commonly used in sports such as racquetball and golf to ensure you keep a good grip on your racket and prevent it from slipping as you make difficult shots. 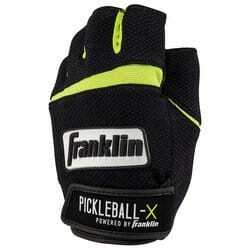 The Franklin Sports Pickleball glove is cheap yet effective for pickleball players. It features comfortable padding to ensure your hand is comfortable and good venting to ensure you don’t overheat while playing for hours. At such a low price, this pickleball glove is definitely worth checking out as a pickleball Christmas gift.